Intrada soundtrack celebration with Universal of 100 years of great cinema continues with world premiere release of top drawer Lalo Schifrin score for stylish police thriller. Eastwood takes break from his international success doing westerns with Sergio Leone, begins his legendary association with Donald Siegel in this exciting tale of Arizona deputy becoming fish out of water in big New York City, attempting to extradite prisoner back west. 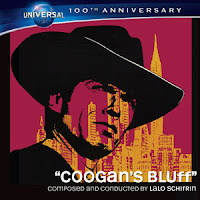 Lalo Schifrin scores with terrific meld of outdoor western theme trapped in tempo of urban big city bustle. Architecture of score is noteworthy: western thematic ideas launch, rhythms increase, then big city colors take over. As Coogan searches for prisoner, cool funky ideas play. Then suspense enters, ideas tighten. 5/5 Intrada Knocks this out of the park with a large bat... this being the world premiere of a great pair... Lalo Schifrin [score] and Eastwood [actor].